Driven by advanced gyro-stabilizers and accelerometers, the 3.5 lbs MōVI will keep a video camera rock steady even when the camera operator is running or trailing an actor down a set of spiral staircase. The flexibility of motion available with this stabilizer is unmatched by any stabilizers and can effectively substitute sliders and jib cranes, as well. 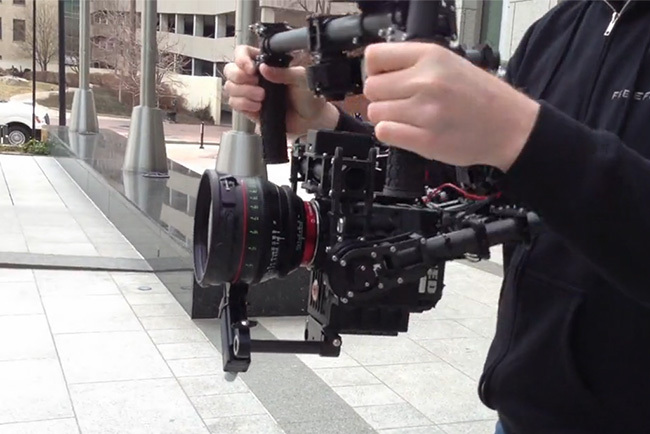 As Vincent said, "If you consider how much we spend on handheld rigs, sliders, jibs (let alone Glidecams/Steadicams etc.) – the price of this device quickly becomes a no-brainer… Another huge factor: it takes quite a bit of time to set up a JIB, let alone weights, crew and skill to operate. The learning curve on this unit is very very fast."